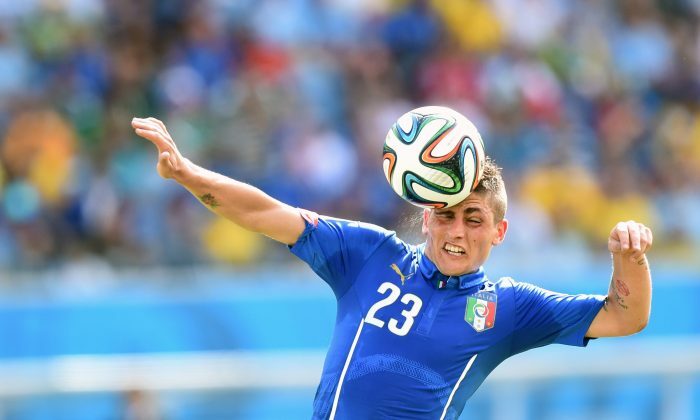 Marco Verratti got injured against Uruguay in their final Group D match today. Antonio Cassano replaced him in the 71st minute. See an Associated Press overview of Tuesday’s World Cup Group C and Group D matches. RIO DE JANEIRO (AP) — It’s Day Two of the in-or-out matches of the World Cup, with five teams competing for two places in the knockout stages. Group D winds up in the two early fixtures, with Group C following later. Each pair of games is played simultaneously. The highlight of the early matches is Italy’s game against Uruguay, a contest between two former world champions that will see the winner go through to the second round. Meanwhile, a Costa Rica side that has already qualified for the last 16 against the odds takes on an England team that has booked its flight home. There are far more permutations to the later games in Group C. Colombia is certain to advance but its opponents Japan, along with Ivory Coast and Greece who meet in the other match, all still have a chance of qualifying. Both coaches are likely to make changes for Costa Rica’s game against England — with Jorge Luis Pinto resting a couple of players and Roy Hodgson giving reserve players a chance. For England, 20-year-old midfielder Ross Barkley is expected to start along with Southampton duo Adam Lallana and Luke Shaw. The team’s exit from the tournament isn’t the only bad omen for Hodgson’s men ahead of Tuesday’s game. The match is being played in Belo Horizonte, where England lost 1-0 to the United States in 1950 — still one of the biggest upsets in World Cup history. Uruguay and Italy meet to decide who stays and who follows England home from Group D. Italy, the 2006 World Cup winner, goes into the game after a humbling 1-0 defeat by Costa Rica, while Uruguay’s players will be on a high after beating England. Luis Suarez scored both Uruguay’s goals in that 2-1 victory and will again be the man to watch, for spectators and Italian defenders alike. A striker who needs only a half-chance to score, his finishing skills have clearly not been dimmed by surgery last month. However, Italy’s ability to defend is legendary in the world game and the Azzurri only need a draw to go through. The match could turn on a counterattack launched by Andrea Pirlo as Uruguay push forward in search of a second-half winner, should the game be deadlocked at halftime. Already assured of a place in the second round, Colombia can secure top spot in Group C with at least a draw against a mediocre Japan side that has only taken one point from two games. Tipped to have a good World Cup, Colombia has lived up to expectations and should have no difficulty finishing the job on Tuesday. The team should also be able to count on their 12th man — the highly vocal Colombian fans who have packed the stadiums in Belo Horizonte and Brasilia. Japan coach Alberto Zaccheroni must decide whether to start with playmaker and star celebrity Shinji Kagawa, who was dropped for the 0-0 draw against Greece after making little impact in the opening 2-1 loss to Ivory Coast. Venue: Cuiaba. Kickoff 4 p.m. local time (4 p.m. in New York, 9 p.m. in London, 5 a.m. in Tokyo). Ivory Coast’s game against Greece will probably be a much tighter affair, with a victory for the West Africans guaranteeing them a place in the knockout stage. A win for the Greeks would see them through if Japan fails to beat Colombia. For Yaya and Kolo Toure, Cameroon’s match will be the first since the death of their brother Ibrahim last week in England. Having decided to stay on at the World Cup, Yaya will start in midfield, with defender Kolo probably on the bench. Veteran striker Didier Drogba is set for another cameo as a second-half substitute. For Greece’s players, the challenge is to do something they haven’t managed up to now in Brazil: score a goal. Venue: Fortaleza. Kickoff 5 p.m. local time (4 p.m. in New York, 9 p.m. in London, 5 a.m. in Tokyo).